We’ve written extensively about the UBS Puerto Rican Municipal Bond Funds. You can find our earlier blog posts here. Puerto Rico’s unique tax regime keeps coming up and we thought it was worth a blog post clearing this matter up. Puerto Rican residents don’t pay federal income tax but do pay very high income taxes. The Puerto Rican maximum marginal income tax rate is 33%, reached at only $50,000 per year of taxable income. The income on Puerto Rican municipal bonds is exempt from the state income tax that would be paid by Puerto Rican investors who bought municipal bonds issued in other states. This difference in tax treatment is one of the justifications offered for the alarming concentration of UBS clients in UBS proprietary closed end funds stuffed with Employee Retirement System bonds underwritten by UBS. This tax justification for concentrating Puerto Rican investors in Puerto Rican municipal bonds is economically identical to arguing that investors ought to concentrate their portfolio in the single stock with the highest expected return. For example, it is equivalent to arguing that investors should put 100% of their investments (or to take the UBS approach, substantially more than 100% of their investments) in Zoom.inc because it has the highest beta and therefore the highest expected return. You don’t have to be old enough to remember the tech wreck to know this is unsound advice because it ignores the very high risk associated with a concentrated and leveraged investment in Zoom.inc. We plot the annualized return and risk from 2003 to 2012 derived from Standard and Poor’s Municipal Bond Indexes in Figure 1. 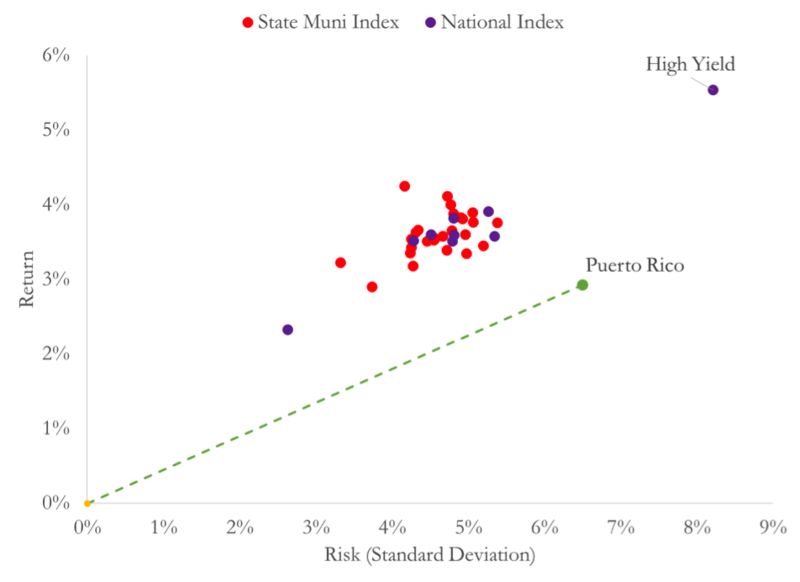 The red dots represent combinations of risk and return for state specific indexes, the blue dots represent national portfolios and the green dot is Puerto Rico. Notice that Puerto Rican municipal bonds had lower returns and higher risk than the mainland states and national municipal portfolios before the losses in 2013. Figure 1. Average Annual Pre-Tax Total Returns and Standard Deviations for Puerto Rico, 26 States and 9 National Municipal Portfolios. The slope of a line from the origin to a point on the graph is the ratio of realized returns to realized risk. This is sometimes referred to as a Sharpe Ratio. Portfolios with higher returns per unit of risk (i.e. steeper slopes) are preferred. Ignoring taxes, Puerto Rican municipal bonds experienced lower risk-adjusted than the 26 individual states with 10 years of data. Contrary to parties defending the concentration in Puerto Rican investors’ accounts, that judgment still holds when we incorporate taxes. We plot the returns and risk from Figure 1 after reducing the returns by the maximum marginal income tax rate in Figure 2. The cloud of red and purple dots have become triangles and shifted in toward the origin but remain above the dotted line connecting the origin with Puerto Rico’s realized risk and return. Figure 2. Average Annual After-Tax Total Returns and Standard Deviations for Puerto Rico, 26 States and 9 National Municipal Portfolios. We could complicate this analysis further by separating out coupon interest from capital gains and losses but the result remains unchanged. 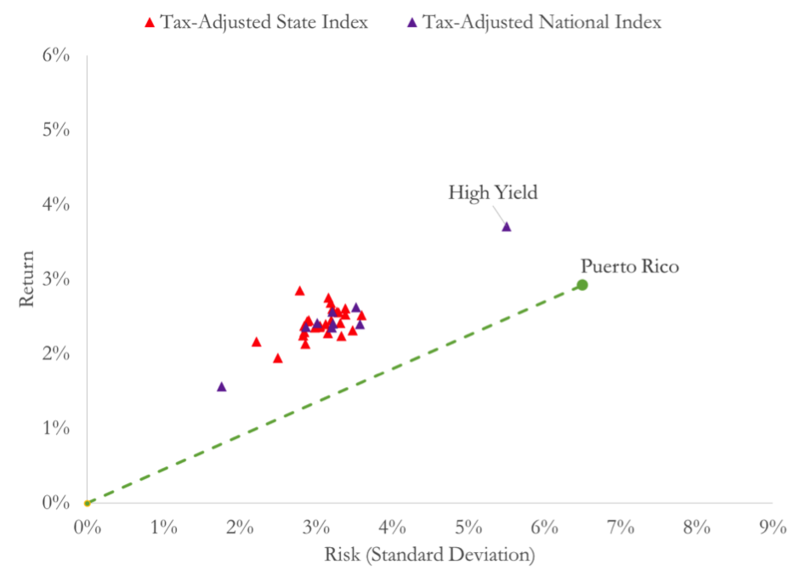 The tax benefit Puerto Rican investors receive increases the after tax returns and risk of investing in Puerto Rican municipal bonds relative to investing in the municipal bonds issued in other states – and the Puerto Rican municipal bonds were already much more risky than bonds from other states. Differences in estate taxes also don’t explain the concentration observed in Puerto Rican investors’ accounts. Exemptions from estate taxes available to Puerto Rican investors apply to other assets – not just municipal bonds and funds that hold them – and so don’t justify such concentrations in the UBS Funds and UBS underwritten bonds. Other estate planning techniques allow diversified portfolios to pass from one generation to the next in Puerto Rico. Portfolios were concentrated in UBS Funds and UBS underwritten bonds without regard to whether the estates are small or large. Portfolios were concentrated in UBS Funds and UBS underwritten bonds without regard to the age of the accountholder. To sum up, taxes are painful but they don’t justify concentrating Puerto Rican investors’ portfolios in the UBS Funds or the Puerto Rican municipal bonds more generally any more than high betas justified concentrating portfolios in tech stocks.